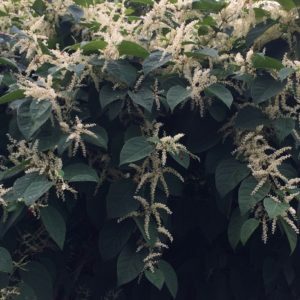 This is Japanese knotweed, Polygonum cuspidatum. 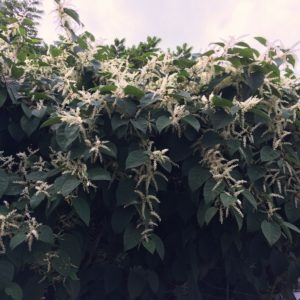 For those concerned about invasive species moving into our region, this plant would appear on a short list of major trouble-makers. 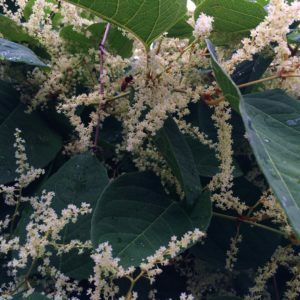 Devouring creeksides and roadsides alike, Japanese knotweed is an intense grower. Just ask anyone who has found it growing somewhere they wished it weren’t. Those of us however who see plant “invasions” from an alterate perspective, have the opportunity to view this plant differently. I would like to suggest that Japanese knotweed is a significantly important plant for this day and age. It is a powerful warrior whose strength offers much-needed restoration both for our ailing planet, and our precious bodies. A member of the Buckwheat and Knotweed (Polygonaceae) family, Japanese knotweed shoots up from the ground each spring, with reddish-green coloured spears, the stalks encircled with rings at about 15 cm intervals. Young leaves hug the stalk, eventually growing outwards as the plant develops. In a season, it can grow to over 7 feet tall, with its ringed cane-like stalks resembling bamboo. These tall stalks remain standing after the entire plant dies back for the winter. Showy white flower clusters emerge from the leaf axils from mid-late summer. 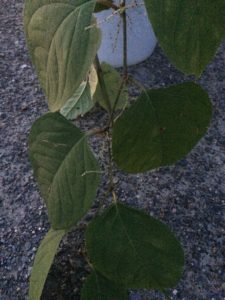 Its thick broad leaves have short petioles (stems) and pointed tips. It grows vigorously on moist soils in partially shaded areas, and alongside moving bodies of water. Its deep roots establish themselves with intensity. 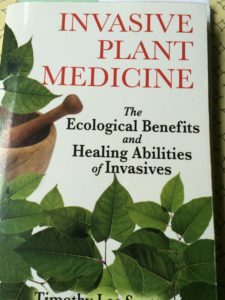 I have taken much inspiration from a noteworthy book titled “Invasive Plant Medicine”. It was written by Timothy Lee Scott, an acupuncturist and herbalist from Vermont. As you can see by photo on the cover, Scott considers Japanese knotweed to be a particularly important medicinal invasive. He discusses some of the plant’s bioremedial benefits. 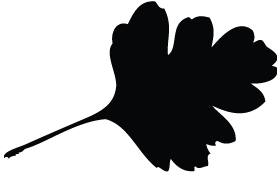 A major one is its ability to thrive in toxic soils. It takes up heavy metals and poisons without being damaged while most other plants perish under similar conditions. Thus it has the capacity to detoxify damaged land. Now this makes me think…..It thrives in toxic soil. 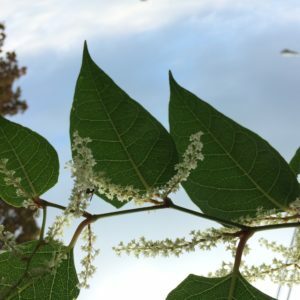 It’s considered a problematic invasive plant due to resilient growth in the many locations where it establishes itself–despite numerous efforts to erradicate it. We must admit that at this point, our earth holds an accumulation of toxic waste. It is in need of detoxification, and for that matter, so are many of us. Hmmm…maybe THAT’S why the plant is taking up more and more space here… Some food for thought. 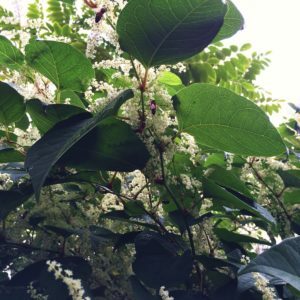 While it detoxifies, Japanese knotweed also brings organic matter, shade and moisture where it is needed in order to support habitat restoration. Over time, it revitalizes damaged ecosystems, providing a cleaner and healthier space to support new creatures and plants. It is a significant nectar source for honey bees as well as other important pollinators. You can see a few of them at work in the photos above and below these paragraphs. 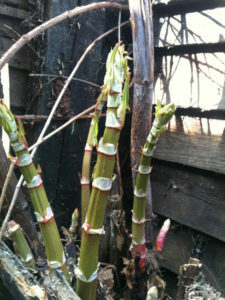 On the topic of food and habitat, I should mention that the spring shoots of Japanese knotweed make a delectable vegetable. They can be cut to the ground when they’re about 1 foot tall (around late May-June in these parts), and pan-cooked like asparagus. They have a lemony flavour and slippery texture resembling that of cooked okra. We like to cook them with eggs, mushrooms or scrambled tofu. They’re also nice as a simple side dish, perhaps cooked with a little garlic and olive oil. Spring shoots. Photo courtesy of TP Knotweed Solutions, UK. Harvesting the shoots cuts back on the plant’s population, so those folks troubled by its invasive nature can take heart that a helpful solution would be to nourish ourselves with it! This is crucial however: Many folks have tried (unsuccessfully) to eradicate Japanese knotweed using toxic herbicides. Therefore, all foragers must be sure to harvest shoots ONLY from patches on clean ground that has not been sprayed. At this point I must mention some important medicinal properties offered to us by this powerhouse of a plant. 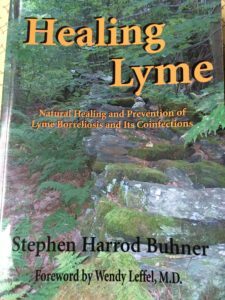 In his famed book “Healing Lyme”, reknowned herbalist Stephen Harrod Buhner lists Japanese knotweed as one of the most important herbs in a protocol for fighting Lyme disease–a growing epidemic in our region. The roots of the plant are used for medicine, having a strong immune enhancing capacity. They are high in vitamin C, and are a major source of resveratrol which supports blood vessel health and circulation while reducing inflammation, oxidation and blood coagulation. This helps carry the immune cells through the bloodsteam, even to hard-to-reach areas where the Lyme bacteria tend to hide out in the system and cause problems (such as the joints, eyes, skin and heart). The roots are significantly antimicrobial and antifungal, helping to fight off many nasty infections including staph, strep, pneumonia, e-coli, salmonella and candida albicans (to name a few). I have to say that I am so glad we have access to this very helpful medicine at a time when we need it. We don’t need to be cautious of overharvesting this plant, as there is more than enough for us to use. 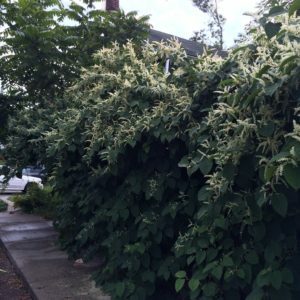 I believe that if we keep paying attention, we’ll probably learn much more about what Japanese knotweed can do for us, and what it’s already doing for the earth. Since Japanese knotweed can absorb heavy metals, can we still eat it safely? 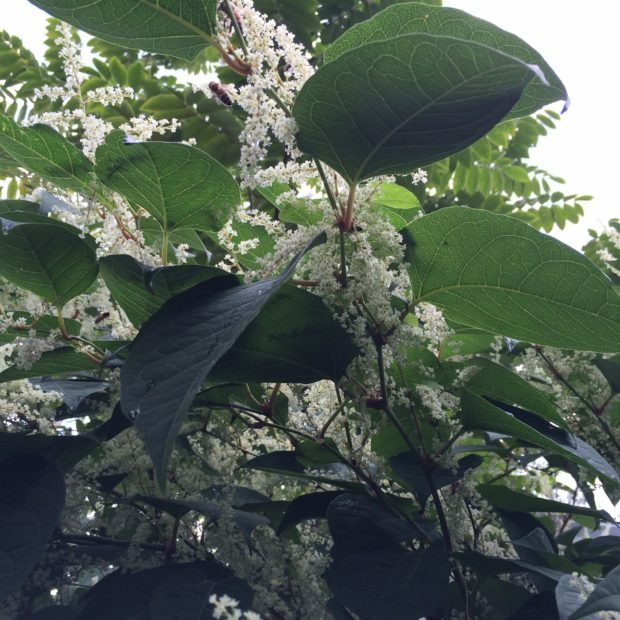 It is important to be familiar with the land where the Japanese knotweed is growing. I would not deem it wise to ingest, unless I knew that it was not growing near runoff of industrial waste or conventional agriculture. 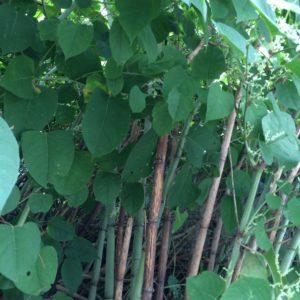 How can you tell if the knotweed has been poisoned? I have head that there were people seen spraying in a very rural area…btu when I went to look at the patch….it was healthy looking and thriving…how can one tell? You need to be familiar with the area where you would like to harvest it. You can ask local people or the municipality to get information on their practice of spraying herbicides. And if you don’t know, err on the side of caution! It is often poisoned in (usually futile) attempts to remove it. So it’s best to inquire about any patch that you find. It will often still look healthy because it can usually withstand or quickly recover from being sprayed–so that is not a good indicator, as you’ve seen for yourself. Great article. Thanks, I look forward to trying them this coming Spring. Let me know if you find a special way to prepare it!